When you hear the word Africa, you think of breathtaking views of a savannah landscape filled with all sorts of safari wildlife. Many of the people who visit Africa from all over the world come to this continent for a close encounter with some of nature’s most magnificent creatures, often seen only on TV. In fact, many of these species can only be found in Africa. So, if you’re on an African tour, make sure you don’t miss out on any of these iconic animals. To help you out, here’s a quick list of them and the best places for spotting them. Nothing says safari more than the iconic king of the jungle, the lion. Seeing a lion in its natural habitat feels entirely different from viewing it in a zoo. Here, you’ll see lions socializing with their pride and, if you’re lucky, you might even see some lionesses hunting prey. It’s just sad to know that this proud species is constantly being threatened by human expansion and unregulated hunting practices. Your best bet for finding lions is Kgalagadi Transfrontier Park, just by the South African border. Alternatively, you can check out Serengeti National Park in Tanzania. As the largest land animal in the world, seeing the African elephant can be a very humbling experience. They’re found in a wide selection of sub-Saharan habitats such as deserts, savannahs, and forests. For herbivores their size, it’s no surprise that they consume as much as 990 lbs. of vegetation every day. While elephants are very peaceful in nature, they can be dangerous when provoked. With the continuous poaching of their kind, however, humans are probably more dangerous to them than they are to us. You’ll find these gentle giants in Hwange National Park in Zimbabwe as well as in Chobe National Park in Botswana. Giraffes are REALLY tall. 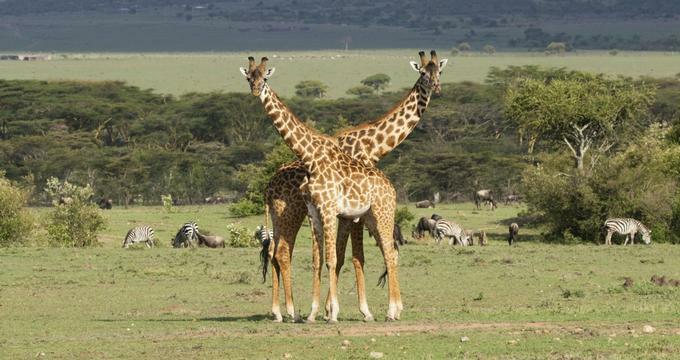 In fact, they’re the tallest animals on Earth. You’d be surprised, however, at how difficult they are to spot during safaris. This is because their distinct brown and white colorings make them especially good at camouflage. So, don’t be surprised if you suddenly see a giraffe appear from a nearby bush. Most have blue tongues and stubby protrusions that look like horns, and prepare to be amazed at how long their necks can be. You’re bound to see a whole bunch of Maasai giraffe in the Serengeti. You can also go to Uganda to see the endangered Rothschild’s giraffe in Murchison Falls National Park. Only found in sub-Saharan Africa, the African leopard is a very elusive subspecies of leopard. While they do live in different kinds of habitats, they’re especially hard to see because they’re nocturnal by nature and they tend to avoid humans. Leopards like to climb trees to scout the area as well as to sleep the day away without being disturbed, so you’re most likely to see them snoozing in the trees. They are classified as vulnerable on the IUCN Red List. Go to the Sabi Sands Game Reserve in South Africa to find leopards. Zambia’s Luangwa National Park is also known for leopard sightings. Africa has two species of rhino and you can distinguish them by the shape of their bottom lip: White rhinos have square bottom lips while the black ones have pointy bottom lips. Both species, however, are constantly under the threat of rampant poaching activities, with the black rhino having a population count of less than 5,000 left in the wild. They’re also one of the heaviest land mammals, with an adult male weighing about 5,100 pounds. They’re short-sighted and often live solitary lives. The easiest way to see a rhino is to go to Etosha National Park in Namibia, which is famous for its rhino conservation efforts. You’ll have a chance to spot both black and white rhinos here. Slender and speedy, these big African cats are known to run as fast as 70 mph, making them the fastest land animal in the world. Unfortunately for them, they often have their kills stolen due to their inability to defend their catch from stronger animals. There are only about 6,600 left in the wild, making them very endangered. Cheetahs prefer to live where there is enough open space to allow them to reach their top speeds and can be found across southern and eastern Africa. The Maasai Mara National Reserve is an ideal environment for cheetahs, so you’ll find them there. There are also some at the Okonjima Game Reserve, located in Namibia. Buffalo often live in herds, moving around to find grazing spots. Thanks to their robust bodies and horns, they fear very few predators except crocodiles and lions. Unlike the Asian sub-species, the African buffalo has never been tamed by people because they tend to be aggressive and have unpredictable behavior. You’re likely to see a herd of buffalo as you journey the savannah, but try to avoid close contact with them as they have been known to cause lots of human deaths every year. They’re not considered to be one of the continent’s most dangerous animals for nothing. You can find a lot of buffalo in Tanzania’s Katavi National Park. Another good place to find them is Chobe National Park. Reminder: When going on a safari, keep in mind that safety comes first. Always be aware of the safety precautions before going out to look for these animals. More importantly, always stick with you guide. As beautiful as these creatures might be, they remain wild animals and should always be respected. With that being said, also be on the lookout for zebras, crocodiles, and hippos. Africa is home to all manner of beautiful creatures that will make your trip worthwhile.